To Cite: Yousefi Z, Mottaghi M, Rezaei A, Ghasemian S. Abnormal Presentation of Choriocarcinoma and Literature Review, Int J Cancer Manag. 2016 ; 9(2):e4389. doi: 10.17795/ijcp-4389. Introduction: Gestational trophoblastic neoplasms have highly been malignant potential, which usually occurred in child-bearing age women. Unusual feature of this malignancy would be rare, it was important to take in mind the possibility of GTN in different manifestation. Based on the above mentioned, the aim of this presentation would be the management and outcome of a case series of choriocarcinoma patients with abnormal manifestation. Case Presentation: We have presented four patients, first who initially manifestation with signs of septic shock, the second case with severe gastrointestinal hemorrhage, the third case with postpartum infection and the forth case was a postmenopausal bleeding patient. Conclusions: In case of metastatic choriocarcinoma with precise history, accurate diagnosis and appropriate treatment have led us to curable results. Choriocarcinoma has known as a rare tumor with highly malignant potential with tendency to widespread dissemination metastases. Pelvis was one of the initial sites of metastasis; moreover, high mortality rate has observed in patients with extra pelvic metastasis. Unfortunately, the patients with choriocarcinoma despite widespread disease might have no specific symptoms, but it should keep in mind that early diagnosis and appropriate chemotherapy could be curable (1, 2). Extra pelvic metastasis in gastrointestinal tract has been very rare especially as an initial involvement. In review of literature, about 15 cases of a metastatic choriocarcinoma to gastrointestinal tract have reported and small bowel involvement obtained in less than 5% of patients (3, 4). 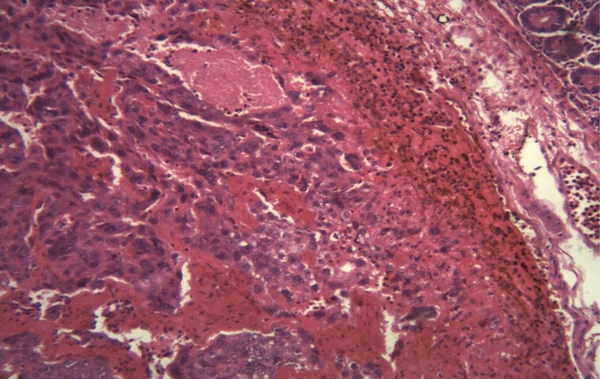 Postpartum choriocarcinoma with a live birth have highly complicated, a survey of literature illustrated metastatic disease has presented in 31% of cases after live birth (5, 6). Primary or metastatic choriocarcinomas of the cervix, small bowel, kidneys and post-menopausal were infrequent (7, 8). The aim of this presentation was the management and outcome of a case series of choriocarcinoma patients with abnormal manifestation. The first case was a 36-year-old woman G5 has admitted in the department of gynecologic oncology with signs of septic shock. Her initial symptoms were fever, hypotension, severe anemia, (initial hemoglobin level was 7 g/dL). In addition, in abdominal examination, we have found tenderness in lower abdominal area and a soft mass near the umbilical level which was palpable. In vaginal examination, profuse necrotic and bad odor discharge has observed, and also, a large uterus as equivocal sixteen weeks of pregnancy was palpable. Ultrasonography has detected a large uterus with echogenic area in the uterine cavity and chest-X ray revealed a round shadow in the upper lobe of lung which was suggestive of a metastatic lesion. Because of unfavorable condition of the patient, she has undergone emergency surgery. In laparotomy, it has appeared a large irregular mass in cervical region until the isthmus about 20 × 25 cm with extension to surrounding of bladder tissue, but uterine wall was intact. Subsequently, resection of the lesion has performed. Histological examination of total abdominal hysterectomy has revealed the metastasis of choriocarcinoma in cervical canal (Figure 1). Postoperative evaluation has demonstrated serum bhcG level 100,0000 mIU/mL, and we have observed bilateral plural effusion in chest-X ray, but in other sites, demonstrable metastases have not seen. Based on the WHO system scoring, score 12, so (EMA-CO) regime have administered, and following four cycles of adjuvant combination chemotherapy, remission has obtained with normal limit serum bhcG. Therefore, the patient has monitored closely with serial bhCG assessments. The second case was a 34-year-old woman G3 presented with postpartum abnormal vaginal bleeding and unresponsive to medical therapy. She had the history of two episode of uterine curettage with interval 20 days. We have admitted her because of continuous vaginal bleeding and serum bhcG level 450 mIU/mL. Uterine sonography has shown a heterogenic mass 12 × 25 cm in the uterine wall, chest-X ray and CT-scan revealed metastatic lesions in her lung. After two days, an unusual feature of massive rectal hemorrhage occurred which we could not perform colonoscopy examination. In addition, abdominal CT-scan was normal, but involvement superior mesenteric artery has achieved in abdominal CT-angiography. Hemoglobin level has markedly decreased as 4.7 g/dL. Thus emergency laparotomy has performed and lesion 1 × 1 cm in the small bowel has detected. Histological examination of resection of this area has shown choriocarcinoma metastasis in small bowel (Figure 2). Then, serum bhcG level has detected 197,000 mIU/mL. After three days, because of hemoglobin level again has markedly decreased, and the possibility of diagnosis of acute fatal intra-abdominal hemorrhage, we have repeated emergency surgery. Because of impossible definitive surgery, conservative surgery has performed. After few days, based on WHO system scoring 14, combination hemotherapy (EMA-CO) regimen has administered. We could not rescue our patient duo to unresponsive to first cycle of combination chemotherapy and she has succumbed. Intestinal crypt (upper right corner) and invasive sheets of neoplastic trophoblasts with haemorrhage and necrosis. The third case was a 23-year-old unconscious woman G1 with prolonged vaginal bleeding following four months of her postpartum and had fever, chills, nausea, vomiting and headache. A detailed history has pointed out that she had 938,000 mIU/mL serum bhcG values. Abdominal examination has demonstrated remarkable large mass as 16 weeks of pregnancy in lower part of abdomen. Sonographic investigations have revealed large uterus with echogenic mass in uterine cavity with extention to uterine wall (Figure 3) and a hyper echoic large mass in left kidney which has deviated the sinuses of kidney and subsequently one necrotic lesion in her liver. In addition, a dense and soft tissue has also manifested in lower lobe of right lung and CT-scan manifested a localized lesion in the posterior area of brain; therefore, following these criteria predicted stage four of GTN, radiotherapy has performed for brain metastasis and then, combination chemotherapy with(EMA-CO) regimen has administrated for other legions. Fortunately, the excellent response has obtained after administering six courses of chemotherapy. The fourth case was a 56-years-old women G11 with postmenopausal bleeding history of 6 years ago that her last pregnancy was full term baby (13-year-old girl). She has suffered from vaginal bleeding since a few months ago, and in pelvic examination, there was a bluish mass 2 × 3cm near the urethra similar to melanoma which was not extension to surrounding tissue. 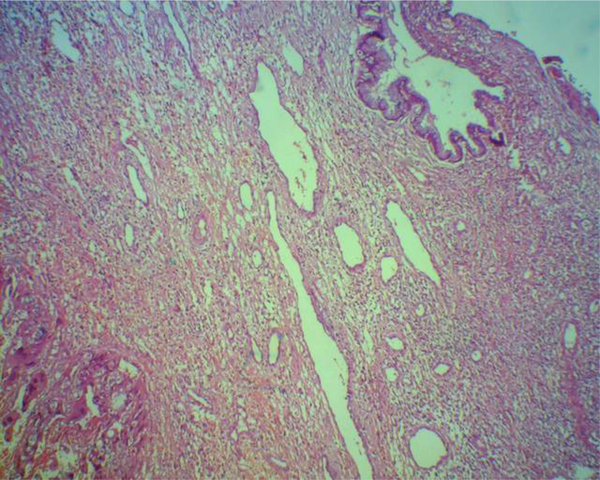 Histological features of tumor excision have demonstrated metastatic choriocarcinoma (Figure 4). Serum bhcG level was 565,000 mIU/mL. The patient has classified as high risk (score 8) based on the WHO prognostic scoring system and with diagnosis of stage IIIc GTN (lung metastases). Therefore, combination chemotherapy, (EMA-CO) regime has administered. After seven cycles of chemotherapy, the patient has improved. Of course, in all of our patients, after normalize serum bhcG values, 2 or 3 additional chemotherapy courses have administered to reduce the risk of relapse. Now after few years, all of them were free of disease. We have presented unusual cases of metastatic GTN which except one of them, the others have obtained complete remission shortly after combination chemotherapeutic agents, surgery and the selective use of radiation therapy. There was no evidence of disease many years since of the management any of our patients. Generally, GTN is extremely responsive to chemotherapy, even in metastatic disease. The therapeutic approach of this condition has included single-agent chemotherapy (lower side effect) in patients with early stage of disease which often was highly effective. In contrast, for advanced stage, multi agent chemotherapy regimens were available for management. However, it should be noticed that despite the excellent effectiveness of this regime, it might associate with an increased risk for secondary malignancies (9). In our practice, combination chemotherapy (EMA-CO) regime has administered in all patients (advanced stage disease) and finally we had favorable response. Recent data from Charing Cross hospital, combination chemotherapy has frequently used (10). Metastatic choriocarcinomas might be relatively common entity following molar pregnancy or abortion, but after normal pregnancy often was an infrequent event, if occurred, we should take highly malignant potential disease (5). We should take in mind the persistent or irregular vaginal bleeding after postpartum. Although to consider possibility of GTN and accurate management, curable results could be achieved. Intestinal metastasis of GTN in small bowl typically has been very uncommon, but we should consider the possibility of them in patients with unexplained gastrointestinal hemorrhage (11). Metastatic lesions of small bowel were multiple and often ulcerating, presenting symptoms of these patients might be spontaneous bleeding at metastatic sites. Also, we should consider the other causes of the small bowel hemorrhage including Crohn’s disease, Meckel diverticulum, arteriovenous malformation and lymphangiectasia (12). However, with precise history, data of ultrasounography, and Barium studies, we might achieve to diagnosis in selected patients. Indeed, angiography might sometimes be useful in recognizing the site of bleeding of lesions (13, 14). In our second case, abdominal CT-angiography was finally able to help us for diagnosis of involvement superior mesenteric artery. The role of surgery for the treatment of patients with metastatic choriocarcinoma is controversial. Also, it has seemed that in a selective subset with local resection of metastatic disease can be achieved cured. Common indications for surgery in GTN based on the study of Lewis et al. has included control of hemorrhage, infection, obstruction and remove resistant to chemotherapy residual disease (5, 15). In our first patient remission has obtained shortly after removing uterus and cervical metastasis. Generally GTN was in neoplasm group with high tendency to rapid spread and dissemination via hematogenous. So, potential risk extrapelvic metastases should be considered. Usually, most common sites of metastases in outside of pelvis were lung, liver and brain. Involvement of kidney was very infrequent (16). Wang et al. believed that renal metastasis was often secondary to lung metastasis. 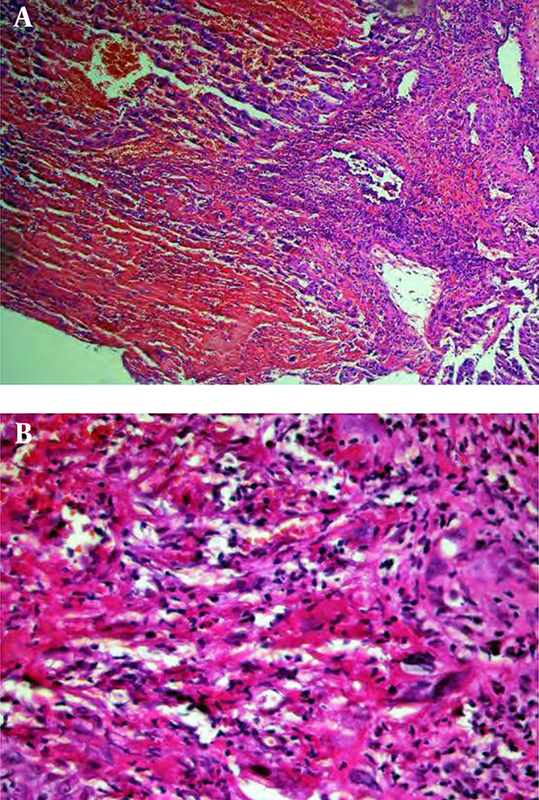 Successful control of retroperitoneal hemorrhage in bilateral renal metastasis of choriocarcinoma with angioembolization has reported and also the patient died due to life-threatening postoperative sepsis (17, 18). In this article, we have achieved successful management in our patient with chemotherapy. It has well recognized that in postmenopausal woman, the possibility of pregnancy was very rare, according to above mentioned, assessment of serum bhcG as a first priority has seldom considered. Few cases of choriocarcinoma that developed after a long latent period from a previous pregnancy have reported (19, 20). However, due to delayed diagnosis of choriocarcinoma, these patients have admitted in advance stage. We have also diagnosed our fourth case in stage IIIc of GTN. Therefore, our recommendation was consideration the possibility of GTN in different ages with different presentation. We have kept in mind that for excision of vaginal metastasis of GTN due to the risk of vigorous hemorrhage, a deep caution should take continuously. Also because of the possibility of diagnosis of melanoma and less probability of GTN, excisional biopsy has carried on for the fourth case (21). Based on significant progress over the past decades in chemotherapy management of GTN patients and attention to high responsibility GTN to chemotherapy drugs, despite metastatic disease, it could consider a curable disease and could effectively manage by focus on modalities such as chemotherapeutic agents specially in experience center (22). Despite gestational trophoblastic neoplasia has characterized as a highly curable malignant disease, moreover, due to unusual occurrence GTN, unfortunately we have sometimes observed fatal cases, therefore, it might suspect when there was persistent or irregular vaginal bleeding.